The first frost is a hog’s holiday. It’s as if the whole world tilts and vegetables roll toward the commodious jaws of our pig, Christopher Hogwood; zucchinis the size of baseball bats, tomatoes that were caught on the vine, broccoli that has bolted, squash going soft in one spot. Our friends, gardeners, come and render unto Hogwood that which is his. The dreams of the winter seed catalog, the toil of the blackfly season, the loyal watering of July, he takes it all in, joyfully grinds it down—grabs a pumpkin and shakes it from side to side, crushes a beet, snout upward, with red beet juice dripping from his jowls. In small towns, and society in general, we live by the Don’t Ask. We let our neighbors pursue their lives, in happiness or sorrow. We don’t interfere; we don’t snoop. We ask each other for time, respect, patience, understanding, visibility, and invisibility. Look at us, look away. Invisibility is essential. We avert our gaze. We mute our curiosity. We give our neighbors the room to live. We don’t question their contradictions. When I was younger I would have called this hypocrisy. Now I think it may be kindness, or just the mercy we show each other. It is, however, tangled up in false telling, and you have to refuse a numb acceptance of cruelty and suffering. It’s a perfect memorial and it almost capsizes the ship. The funeral upsets the elders downstairs. Not only have they lost a friend but they are thinking: My children, my grandchildren will never speak this well about me. Will they even show up? My funeral won’t be this good. I’m not as good a grandmother as she was. My grandchildren aren’t as good as hers. My family isn’t as close as hers. My funeral will never equal this. This is how things really work in small towns. People get together, figure things out, and walk the crooked path to a solution. One woman I know told me about how she used to help an old neighbor. “He had all sorts of problems,” she said. He was quite ill. “I used to pick up his urine sample every morning and take it to the hospital,” she said, and added that you can’t do that anymore, just waltz in with your neighbor’s piss. There has to be a “chain of custody.” But back then, you just did what needed to be done. This is not a heart-warming story. Norman Rockwell would never paint a picture of The Urine Pickup, and you won’t find it in Our Town. But it’s a New Hampshire story; it looks directly at the unpleasant facts, and takes care of them. "A wonderful book. An insightful but droll glimpse inside the life of one New England town. 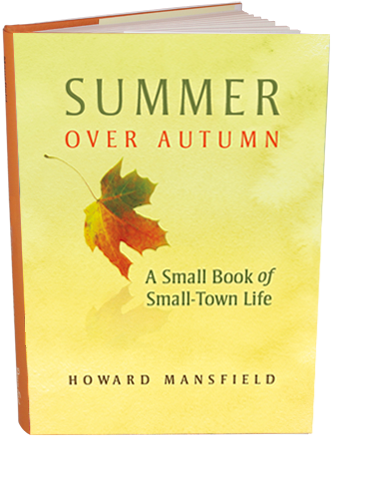 Bringing us the small events and encounters with neighbors and townspeople, Howard goes straight to the heart of the inscrutable nature of small town life, of New England life. We are left with no choice but to love this book."